The lead investigator in the Sh9 billion NYS scandal has been dropped from the case after he was implicated in corrupt business dealings and sexual advances towards Anne Ngirita. Chief Inspector of Police Julius Muia was incriminated in a damning affidavit sworn by one of the suspects, Jeremiah Ngirita. Jeremiah claims that the inspector has been his business partner and that they have traded with the National Youth Service since 2014 through his company Jerricathy Enterprises. They have reportedly been supplying hardware material and renovation facilities to the NYS in Gilgil. In the affidavit, Jeremiah claims that, “I, together with Mike Julius Kingoo Muia, have been carrying out the business of supplying hardware and renovating facilities at the National Youth Service in Gilgil. “After our business and relationship went soar, Mike Julius Kingoo Muia vowed to use his position to fight our family,” he argues. Jeremiah further produced bank slips as evidence that he has been depositing money into Muia’s Cooperative Bank account. 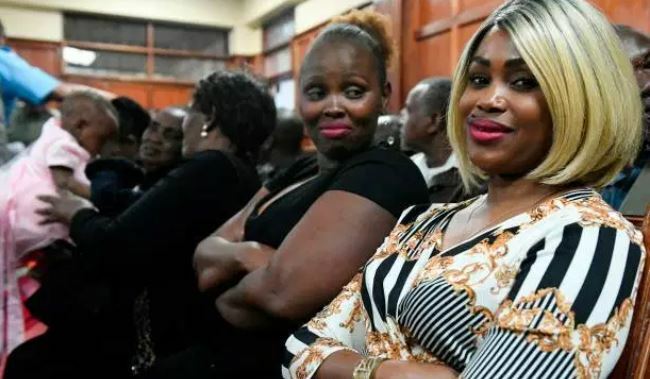 On top of all that, Ngirita also accused Muia of making sexual advances towards his sister Ann Wambere Ngirita during investigations. “The cause of all the allegations against me and my family is due to the business disagreements between Mike Julius Kingoo Muia and ourselves. All the said allegations are totally false and malicious,” he said. Muia swore the affidavit that saw 43 suspects denied bail and remanded by the Anti-Corruption court magistrate. He was supposed to have disqualified himself from the probe. His removal is detailed in an affidavit sworn on Monday by inspector Paul Waweru, who is his junior. The affidavit was in objection to eight applications challenging the denial of bail for the suspects. Reports indicate Muia has since been sent to Kiganjo college for training and may be headed for lighter duties outside Nairobi. Responding to Ngirita’s allegations, Muia said the claims are only meant to divert attention and jeorpadise the ongoing probe. Jeremiah Gichina Ngirita’s main intention is to delay the prosecution of this matter and divert attention from the main issues,” said Muia. “The only time I met Ann Wambere Wanjiku Ngirita was on May 21, 2018 at the Directorate of Criminal Investigations when I recorded her statement under inquiry in the presence of four other police officers amongst them two female officers,” said Muia. He, however, admitted having been friends with Jeremiah Ngirita, whom he claims to have met in 2013 through a mutual fried known as Sammy Kioko. “As friends we could borrow money from each other. After borrowing money from either of us, Jeremiah Gichina Ngirita used to give us cheques to deposit after a period that we had agreed on,” he said.